Looting the Un-lootable WITHOUT Booms! Malonik has fashioned a new video around looting un-lootable loot rooms. This video covers the basics to learn and understand what the un-lootable design is and what it does. Malonik’s video covers one method of un-doing the exploitative nature of these design trick. It enables players so that they can access the contents of a loot room without spending additional explosives. Hey guys! Mal here and today I want to quickly show you how to loot the un-lootable loot rooms without using a single boom. 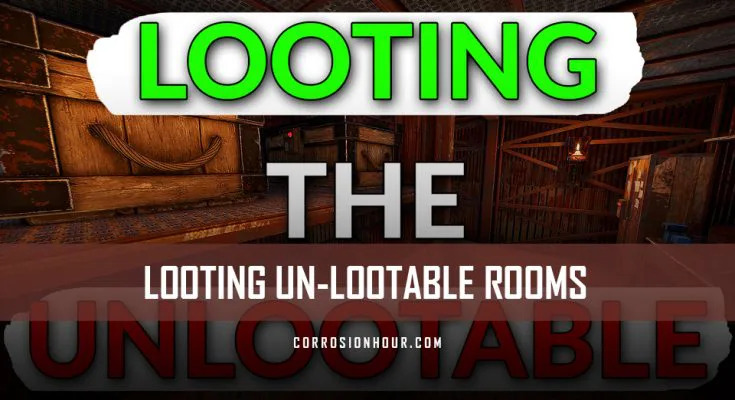 The un-lootable loot room is a cheap and extremely effective way to keep your loot relatively safe or at the very least out of the hands of raiders. In case some of you have never seen these before I’ll quickly run through how they are made and work. First you build half walls around your loot room and upgrade the foundation and walls to armored. Drop two large boxes down, one in each back corner like this. Throw code locks on them and get anyone that needs access to authorize. Put a floor in half way and upgrade it to armored. Next put two half walls on the front in twig. Destroy the bottom half wall and put in a low wall. Upgrade both of these to armored and you’re done. Now the way that these work is pretty brilliant. You can stand in front of it and access the boxes like a normal loot room. Whereas raiders are going to have to break the boxes to get at the loot. However, when they do so the loot satchels drop out of reach and they have to burn 15 rockets to get in if they want the loot. Well until now that is. So how do you loot one of these things without using any booms. Firstly, you’re going to need building priv so if you find one of these loot rooms while raiding leave it until you get the tc. Once you have building priv come back to it with some wood and about 5 or 6 small boxes. Throw a small box down on top of the back third or so of the loot satchel like this. Now we need to get the building to update so we’re going to build something in twig and if we watch the loot box while we do it. That’s right, it nudges it forward. Rinse and repeat about 4 or 5 more times and each time the loot satchel will be nudged closer and closer until you can finally reach and loot it. Also, it is very important that you don’t cover too much of the loot satchel with the small boxes. If you do it will get pushed into the floor and then you’re basically screwed and have to burn the booms to get in. Anyway, that’s it from me for this video. I know i don’t usually do-little videos like this but i felt it was a really handy trick and wanted to make sure as many of you know about it as possible. Hopefully it helps next time you’re raiding and come across one of these loot rooms. If you’d like more helpful quick tips like this leave a comment and smash the @$^! Out of that like button so i know. Also, if you aren’t already, subscribe and click that little notification bell so you don’t miss any of my future content.